Latina Cubicle Confidential™ –Help Wanted—IF You’re Already Employed! is the latest “ism” to be added to the long list of discriminatory practices that Corporate America just can’t stop making up. Racism, sexism, ageism, and homophobia must now make room for “joblessness”. While no one today posts a job opening using the racial and ethnic epitaphs of the 1950’s like “ITNA: Italians need not apply” or “NINA: No Irish Need Apply”, companies are not exactly hiding either. 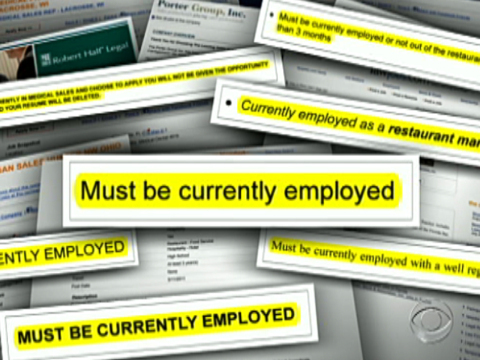 In 2011 the National Employment Law Project found 150 ads that were restricted to “must be currently employed”. The good news is that 18 states and Washington DC have laws protecting against unemployment discrimination. Despite signs that the economy is slowly recovering, four in ten jobless workers –almost 5 million people—have been out of work for 27 weeks or longer. While Latinos make up 16% of the total labor force they are 19% of the long-term unemployed. Fortunately, the trend is moving in the right direction: In 2010 the US Labor Department found 6.7 million people had been out of work for over 6 months. If you are over the age of 45, and one of the 27 million who are unemployed or underemployed, don’t give up! Do get clear on the facts to protect yourself and develop a very specific strategy for looking for work. Take the time to join a job search support group and continue to stay connected to others. Despite the use of online job boards and application portals, it is still the case that you will find work through someone who knows you and your skills. If you are not using LinkedIn already, set up time to learn how to make this your virtual resume and to network through the many groups you can access there from your on-line career profile. If you must use a paper resume, make sure you show only the most recent 10 years of work so that age discrimination is not something you have to face. List your references and their telephone numbers at the end of your resume. Have others endorse you or recommend you on LinkedIn. It is vital to spend quality time on-line. Don’t just visit the job boards or read about how tough it is get work. Take time to look at the websites of your local nonprofits, faith-based groups, or professional association websites. You might find work by attending special events that allow you to meet potential employers. While you may think social media is just for fun or for the very young job seeker, think again. You might just tweet your way to a new job. Even getting active in on-line discussions or blogs that are about your own interests can bring attention to your skills. One of the biggest challenges I find in coaching mid-career executives who either want a promotion or a new job is to convince them how much career development has changed just in the last 10 years. While everyone accepts that working for 30 years at one company went away several recessions ago, few understand the new pressure to be visible outside of your own workplace. The last ten years have created new expectations that each of us become part of digital communities — Facebook, Twitter, LinkedIn, Google+ are all new ways in which you can talk about your skills, interests and experience. These are not passing fads. Your career depends on staying current in your specific field of work and it equally depends on your engagement online. Newer PostLatina Cubicle Confidential™: When Work and Life Clash—Do You Know the Warning Signs? Older PostLatina Cubicle Confidential™--Is Your Pink Slip Showing?